A Trophy for “Canal House Cooking”? One of my favorite recent cookbooks, Canal House Cooking Volume N°1, Summer, by Melissa Hamilton and Christopher Hirsheimer, was chosen as a finalist in The Tournament of Cookbooks on food52, a nifty new website aimed at serious home cooks (one I only learned of from the release about this book). Competing for the coveted “Piglet Trophy,” the tournament began October 14, and continues for four weeks, narrowing down the list of 16 books to one winner. One of the food52 website founders is Amanda Hesser, the popular author and one time food editor at the New York Times. Follow food52 to see if this underdog can take the prize. 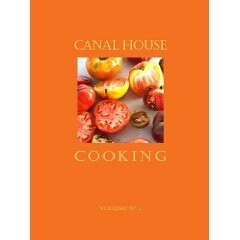 Canal House Cooking is sold on their website, at independent stores, and at Amazon.com. UPDATE as of 10/23 – Canal House won Round 1, and proceeds in the competition to Round 2! UPDATE as of 10/29 – Canal House wins next Round (thanks to Gweneth Paltrow), and proceeds to the final four….